C1 Youth politics promotes democratic vitality and sustainability. In this paper I am interested in challenging P2. Does the increased political engagement due to youth politics promote democratic vitality and sustainability? For the sake of argument, I will posit the trueness of P1. When it comes to P2: it would be difficult to argue that all forms of political engagement promote democratic vitality and sustainability (e.g. authoritarian neo-Nazism or revolutionary Communism). Hence, I shall take it for granted that P2 is constrained to activities and policies compatible with democracy. I intend to demonstrate that youth politics exerts a negative influence on democratic vitality and sustainability, and thus, that it is unethical to continue the current celebration of youth politics. This requires doing four things: In section one, I will develop a methodology for evaluating whether something promotes democratic vitality and sustainability or not. In section two, I will apply this methodology to youth politics. In section three, I will present empirical indicators from Norway, highlighting the most evident problems of youth politics. 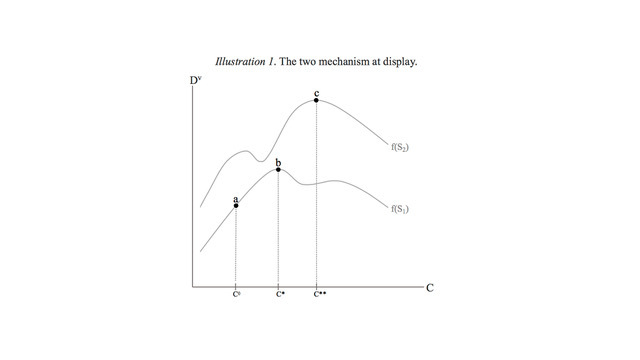 Finally, in section four, I will sketch solutions to these problems. I: Methodology for evaluating effects on democratic vitality and sustainability. 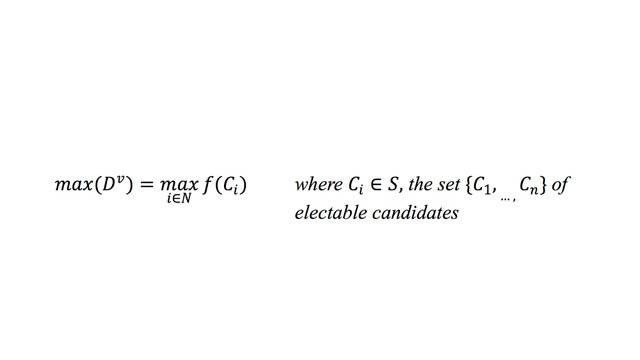 Along the x-axis are different electable candidates, the elements of set S. Along the y-axis are the different levels of Dv that the candidates are likely to achieve. The model captures the moment of election, these critical junctures at the very centre of democratic systems. At elections, the people face the problem of maximizing Dv. I assert that maximizing Dv is contingent on reason and critical thinking. There are two mechanisms at work: First, the more reasonable and critically thinking the voters are, the more likely they are to choose the candidate who produces maximum Dv, given the set S of electable candidates. In short, reasonable and critically thinking voters will be better equipped to identify the most . Second, the more reasonable and critically thinking the candidates are, the more Dv they will produce. In short, the candidates will be better equipped to govern in a way that promotes democratic vitality and sustainability (see Illustration 1). Perhaps the emphasis on reason and critical thinking is justifiable for the voter, whose problem is to identify the most suitable candidate. But surely, some might infer, political virtues like compassion or prudence must, at least to some degree, affect the Dv that the candidate is likely to achieve? Most definitely—but the efficacy of all such virtues is contingent on reason and critical thinking. For instance, for a political candidate, it is never enough simply to exhibit compassionate intentions. To be of political value, compassionate intentions must materialize in the form of actions and policies that exert real impact on the relevant people. And movement from ‘compassionate intentions’ to ‘real impact’ is to a large extent determined by reason and critical thinking. The candidate must ask and answer questions such as: What effects ought to be realized? What measures do actually realize these effects? For P2 to be true, then, one of two conditions must befall. Either youth politics exerts a net positive effect on the reason and critical thinking of voters and candidates, or there is a massive benefit to political virtues, such that Dv increases despite reduction in reason and critical thinking. In the next section I will argue that neither befalls. II: Effects of youth politics on reason and critical thinking. It is quite likely that persons affiliated with youth politics will experience an increased level of political engagement. But how does the increased political engagement due to youth politics affect reason and critical thinking? To this I now turn: I will argue that youth politics exerts two negative interrelated effects on Dv, those of camaraderie and conformity. The first negative effect is related to camaraderie. When youths are introduced to politics, this usually happens through the youth wing of a politcal party. Which party one gets involved with is determined by the preferences held at that particular age, naturally heavily influenced by parents and friends. Thus, it is arbitrary what political community the youth gets engaged with. I use ‘arbitrary’ in the sense that it is not a choice based on reason and critical thinking. It obtains that reason and critical thinking cannot be achieved in a vacuum. Therefore, if the person does not engage in youth politics, he or she will certainly be influenced by other normative forces. Why should this be more desirable? The profound problem with the context of youth politics is that one develops relationships which inevitably depend on loyalty to a particular ideology and set of policies—the very fabric of the political community is political loyalty. In such a community, it seems challenging to pursue reason and critical thinking. This can be illustrated by the way in which parties tend to equate certain policies with the political ideology itself. I believe, for instance, this explains why some parties are so slow to re-evaluating their policies on drug criminalization. A simplified account of their rationale might be: People suffer from drug abuse, and there is less drug abuse if drugs are criminalized, therefore drugs should stay criminalized. But an accumulating body of empirical evidence shows the second premise to be unjustified. That is, is not necessarily the case that there will be less drug abuse if drugs are criminalized. Why do not the parties adjust their conclusion? Perhaps they simply do not believe that the empirical evidence refutes the second premise. However, the lack of willingness to even re-evaluate their conclusion indicates that the parties do not seriously take into account the new evidence. This might be explained by the fact that the parties have made polices on drug criminalization an integrated aspect of their ideological core. The members of the party do not only have to accept such irrationality, but to internalize it. That is, members might argue and disagree on the party’s peripheral policies, but actually to challenge the very core of the party’s ideology seems quite impossible if one is to remain in good standing within the party; challenges against the core of the party’s ideology inevetiably pose an existential threat to the community. And furthermore, because of camaraderie, there even exists a barrier to leaving that community, as leaving it also entails leaving the social community that partakes in identity formation. The second negative effect is related to conformity, and comes as a consequence of camaraderie. The fabric of the political community is, as allready mentioned, political loyalty. Hence, a political community naturally develops mechanisms for defending its ideology against challenging arguments, rather than evaluating the counter arguments on their own merit. This is a problem related to all sorts of party politics. Some might even argue that youth wings are able to initiate changes in the parties (e.g. on drug policies), and thus function as a counterweight to conformity. And this might indeed be true, to some very limited extent. But this misses the most important point—in order to progress within the party, one has to conform to the party line. That is, members desirering political careers within the party must conform to certain views and adopt them as their own, which is a process that is initatiated in the youth wing. After all, if the person does not conform, why should he or she progress to represent the party at large? Those who hold and favor views in line with the community as a whole rise through the ranks, gain more influence over the community, and thus strengthen the effect of conformity. The negeative effects on reason and critical thinking are obvious. I cannot think of any massive gain in political virtues that might justify the negative effect of camaraderie and conformity. Thus, one is faced with the following dilemma: A vital and sustainable democracy requires the engagement of youth, but youth politics acts negatively on the democratic vitality and sustainability. Accordingly, it might be regarded ethically imperative to promote political engagement amongst youth, but to promote youth politics must be regarded as unethical. I will now present some empirical indicators from Norway, highlighting the problems. III. Norway as case study. In this section, I will present empirical indicators from Norway. With regards to Norwegians in general, only a small fraction have been involved in youth politics (ca 3%), implying that the effects on voters are negligible, interesting only from a theoretical perspective. With regards to the candidates, however, the story is quite another. 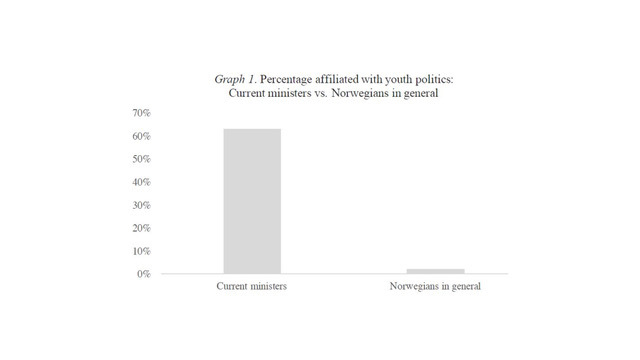 I have compared the fraction of Norway’s current ministers with Norwegians in general (see Graph 1). There is a massive overrepresentation of ministers with a background in youth politics (ca 63%) compared with the population in general. Accordingly, from this point on, I will focus on the effects of youth politics on S, the set of electable candidates. In section one, I argued that one way of increasing Dv is by increasing the suitability of the candidates that constitute S. And it seems unreasonable to assume that Norway cannot achieve a more suitable S. That is to say, it seems unreasonable to assume that the most suitable candidates signal de facto superiority by engaging in youth politics. One can therefore distinguish between two negative effects of youth politics. First, the direct effect: Elected candidates will be influenced negatively by camaraderie and conformity, as explained in the previous section. Second, the indirect effect: There appears to be some undesirable selection barriers which disincentivize potentially more suitable candidates to partake in politics. An example of such a barrier might be the network required to rise in the ranks; people that have not engaged in youth politics will be at a substantial disadvantage compared to those who have. How can one resolve these problems? That is what I will adress in the final section. IV: Potentia solutions to the democratic dilemma and concluding remarks. One thing is clear: The current celebration of youth politics must be regarded as unethical, as it enforces negative effects on Dv. This implies that society in general needs make youth politics less attractive, for instance by paying less attention to the opinions of youth politicans. Other things are less clear, like what policies can be implemented in order to reduce youth politics? The most obvious policy would be to forbid youth from organizing politically. This would naturally be highly objectionable, as it gravely violates fundamental democratic principles such as freedom of speech and organization. It seems like camaraderie and conformity become problems mainly because there is a career continuum from ‘engaged in youth politics’ to ‘elected minister.’ And in order to move along this continuum—that is, for the career minded youth rise through the ranks—negative effects kick in. A solution needs to create some sort of discontinuum. This may be done by setting a minimum age limit to holding any sort of public office. One might also require non-party work experience for eligibility in order to create a similar effect. By creating such discontinuums, one can potentially counter both the direct and indirect negative effects of youth politics. First, one might break down some of the deep relational commitments they have to their political communities. Second, one might break down some of the barriers preventing potentially better candidates from getting involved with politics, that is candidates who have not been involved in youth politics. It goes without saying that the effect of youth politics on democratic vitality and sustainability must be explored by further empirical research and philosophical inquiry. So must potential solutions. This paper has sought to initiate such research and discussion by challenging the collective celebration of youth politics. One of UNDP’s “strategic entry points to enhance youth engagement and participation” is to strengthen “youth political participation at all levels.” Bureau for Development Policy. (2014). Fast Facts: United Nations Development Programme. United Nations Development Programme (UNDP). United Nations. A Norwegian report suggests that the influence of parents might be particularily strong: “Det vi vet er at den politiske sosialisering i hjemmet har stor betydning for de unges deltakelsesmønster.” Ødegård, G., & Bergh, J. (2011). Unge i tradisjonell politikk. Institutt for samfunnsforskning: Deltakelse i valg, kommunestyrer og partier, Norway, p. 15. The data on ‘Current ministers’ (1st of January, 2017) is merely extracted from public records.